"MacArthur High School senior Lauren Gutheridge is shooting for the stars after graduation, hoping to eventually become an astronaut. But during her time on earth, she's making music that is out of this world." summarizes Malinda Rust (Education), The Lawton Constitution. MacArthur High School student Lauren Gutheridge plays one of two etudes that landed her a spot in the Oklahoma Musical Educators Association’s All-State Wind Ensemble during auditions earlier in December. Gutheridge was recently selected as one of only 60 members of the Oklahoma Music Educators Association (OMEA) All-State Band Wind Ensemble. She will play the oboe as second chair during a special concert next month an experience she is anxiously anticipating. "I'm so excited," she said, closing her eyes and imagining the heavenly sound she and fellow musicians will be creating. Participation in the OMEA wind ensemble requires months of training and practice. Prior to the first audition in November, she learned two special pieces of music and spent hours practicing her sight reading an activity that requires musicians to play a never-before-seen piece of music after just 30 seconds of review. Gutheridge trained even more prior to her final audition in December, and now she will spend the next four weeks perfecting about a half a dozen musical selections before the OMEA All-State Convention, at which she and the other high school students from the state will practice together before their concert Jan. 23 at the Tulsa Performing Arts Center. MacArthur music teacher Larry Hatch said it is a tremendous honor reserved for exceptional young musicians. Only 51 students from MacArthur have qualified for an All-State band seat since the school opened in 1969, and Gutheridge is the only student in Lawton to qualify for any instrumental spot this year. 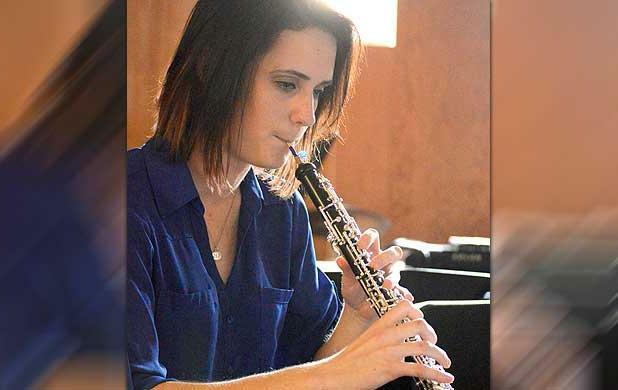 Even though this is her first time qualifying in band (she was an alternate last year), Hatch said Gutheridge, who often trains with private oboe instructors from the area, has been a phenomenal, multi-talented musician for many years. In fact, she has already performed in the OMEA All-State Choir twice as a sophomore and junior. She qualified for the all-state choir again this year, but because of the convention's practice schedules, she had to choose between band and vocal music performances as a senior. "It's unusual for a student to qualify in both choir and band," Hatch said. Gutheridge said she chose to join the wind ensemble to expand her realm of experience. She practically shudders recalling the beautiful sounds she and fellow singers created during the previous concerts and said she wants to experience making a different, yet comparable joyful noise alongside an entire group of talented young musicians. She's already been listening to some of the selections, dreaming about how they will sound and longing to play multiple instruments in the band as a result. Gutheridge said music is a stress reliever. Sure, the high-stakes auditions can be nerve-racking, but music has always provided her with a creative outlet to manage everything from ennui to elation.